The Digital Hand-Held Urine Specific Gravity "Pen" Refractometer PEN-URINE S.G. utilizes the refractive index method to measure the specific gravity of urine. 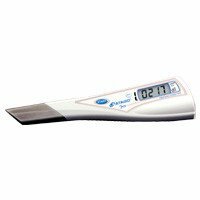 The PEN type refractometer is extremely easy to use. There are 2 ways to measure the sample : Dip the tip into the sample and press the START key OR press the START key and touch the tip into the sample.